Out on the water with fishing rod in hand is the perfect way to spend those few days off of work. 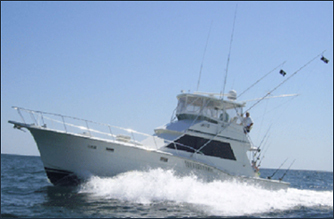 Why not take to the open water on a fishing charter? Though you may be a true captain in the waters off the coast, it doesn’t hurt to have a whole crew there to help you along the way. A fishing charter allows you to have a guided fishing trip where you can sit back and relax and only focus on getting that big catch. That crew that’s guiding you is also there to teach you anything you want to learn about fishing. Whether you want to experiment with your skills or figure out a new technique for casting the line, the experienced professionals onboard are there to help. A fishing charter comes fully equipped with everything you need to score that massive Mahi Mahi or bring home enough fish to feed a dinner party. So the only thing you’ll have to worry about is having fun and fishing, of course! Fishing is all about new experiences. You’re always catching new species of fish and changing up your rods and bait making every trip out on the water unique. A charter gives you the chance to explore new waters with confidence and the crew will be able to guide you along those new fishing territories. Like we said, you have the opportunity to sit back and relax on a fishing charter. There’s no need to worry about equipment or fighting the current when you’re onboard. With amenities like air conditioning, TV, radio, and more, you’ll be able to escape reality for a bit on this fishing adventure. The crew of the Triple-Trouble is ready to set sail with you and your family for an unforgettable fishing adventure! Captain Chad knows the waters off of the Alabama Coast like the back of his hand and will show you all of the prime fishing spots to catch big game. Call Capt. Chad at 256-431-5767 or email him today to book your private chartering!